One of our favorite things to do when we go out of town is to eat at restaurants we don’t have at home. We never say we can’t do chain restaurants although if I have to say, we do prefer to eat at restaurants that aren’t chain restaurants. Not always an option though. So over the Thanksgiving weekend, we wound up eating in Tulsa 3 times. Here are a few of our favorite restaurants we eat at when in Tulsa. My aunt went to Med School. Now, here’s where I tell you I was young when she did that so I’m not sure if she went to Stillwater campus or a Tulsa Campus but I know she did her residency in Tulsa. This was a restaurant she found and introduced us to many moons ago. It was always a restaurant we could remember was on Peoria but never could quite remember the cross street or anything. Finally one day I made it a point to remember 35th street. That’s very helpful! Their Olé Queso is the reason to come here. It’s a creamy queso that’s so awesome! Hubby didn’t order that for us this time though because we were afraid the little one wouldn’t eat it. Turns out she wouldn’t eat the yellow queso either. Figures. It’s a blend of rich & creamy white cheddar, chihuahua, jack, Oaxaca cheeses. I went with a Pork Relleno. I just must state here I love Chile Relleno’s. Add the pork to it and YUM! 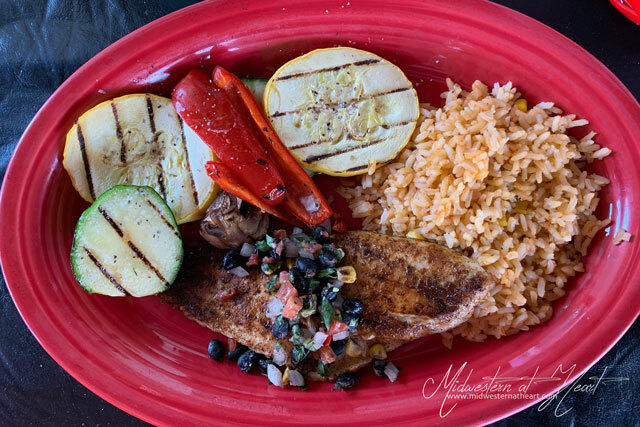 It was served with rice, black beans, and a sweet corn cake. Highly recommend. That’s all. Hubby went with the Salmon. I’m not a salmon fan. He liked it though so definitely go that route if you like fish. I don’t so I’ll probably avoid that. So it turns out that Chuy’s has 2 Tulsa locations. The address listed above and 10808 E 71st St, Tulsa. Obviously, we went to the address above. We first found out about Chuy’s in Rogers, Arkansas. A friend of ours told us about it and then my parents went there and said we needed to eat there as well. They went there a couple weeks before we headed off to San Antonio so they suggested we eat at the one there. 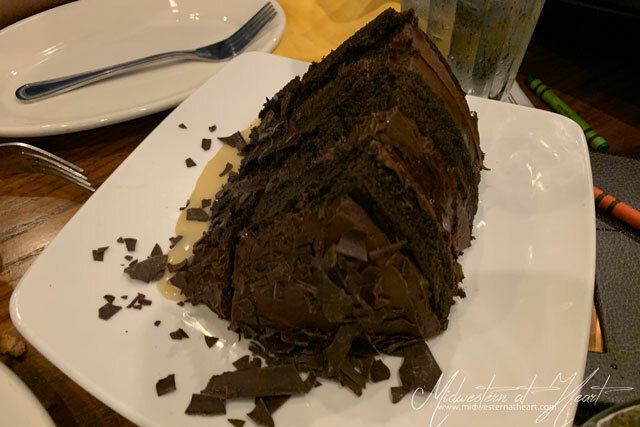 With the whole debacle of getting hubby home from a work trip, we actually wound up eating at the one in Rogers the day we left for San Antonio. Again, I like Chile Rellenos. I have to say they are one of my faves and so… this time that’s what I got. 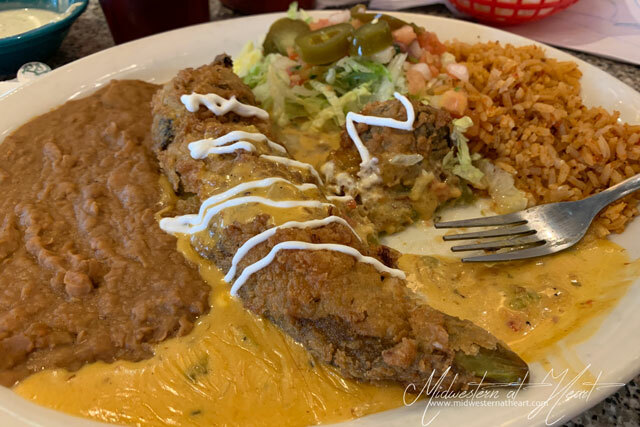 The first time we ate at one, I got meat inside, this time I went with the classic cheese chile relleno. Oh, my goodness I think this was better than the first. No joke. And the amount… they give you 2. Gosh, after Thanksgiving I was stuffed but they were soooooooooooo good. Hubby and dad got the Chicka Chicka Boom Boom. They said it was good too. It was less spicy than the Porka Porka Boom Boom they got in Rogers. 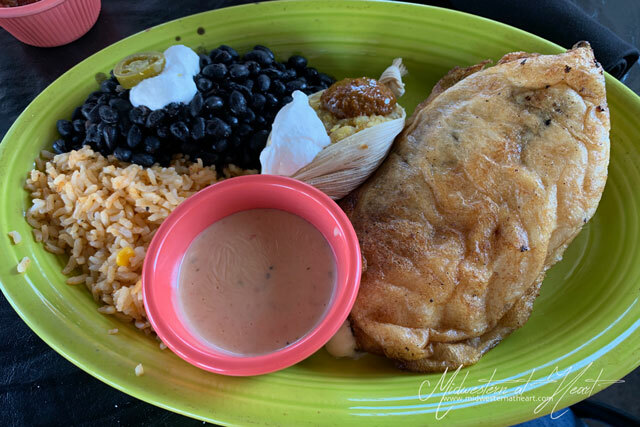 But I can also tell you, I’ll stick with this relleno because… YUM! Finally, after shopping all day, we wound up eating dinner before heading home. Our last stop was Reasor’s so we were looking for a place nearby that wasn’t like Chili’s or Texas Roadhouse… something chain we have at home. As I said, we’re not against chain, we just want something we can’t get at home when we’re out and about. We had seen a Saltgrass and it showed up in restaurants near you when doing a search so that’s what we landed on. I think the first time I remember eating at a Saltgrass was in Norman (or is it Moore? or OKC?). They never disappoint so we decided to hit it up. It seems to be a fairly new restaurant to Tulsa but I could be wrong. It was new to us seeing, how about that. And it’s right off I-44 so easy access really. Now here is where I totally compliment our server! We weren’t ready to order, but the little knew what she wanted so the server took her order. That right there is service. It’s tough making a kid wait and while it is okay from time to time, it’s just also awesome when they bring the order out earlier, etc. So hubby and Tbug got soup, I went with a salad with ranch dressing. Yum! I love salad with ranch dressing. 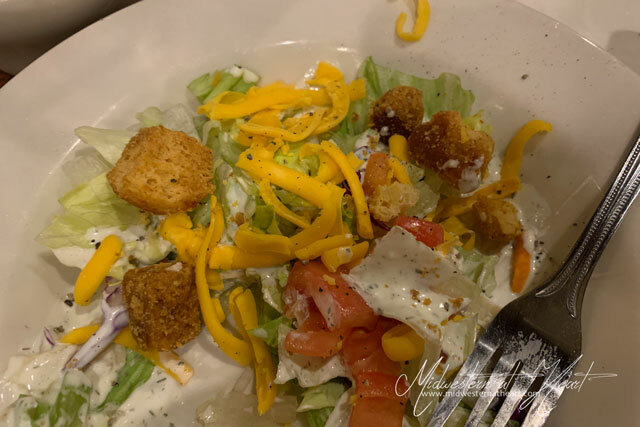 When I was a kid, my salads consisted of ranch dressing, cheese, and croutons. At least I add the greens in now :). 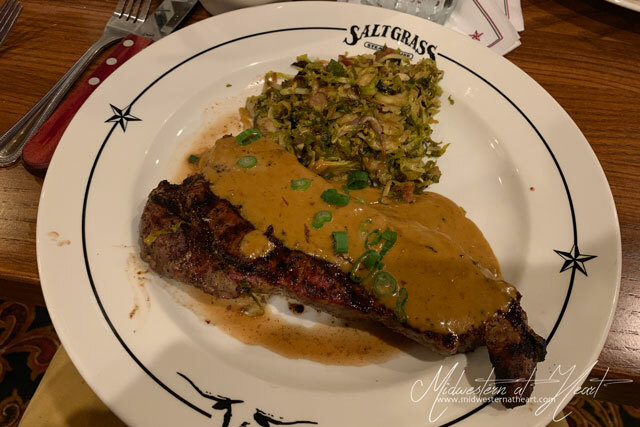 I don’t remember if this was on the little add-on menu inside the regular menu or what, but this Peppercorn Steak sounded sooooooo good. And let me tell you it was. Now, I ordered it Medium Rare and I think it came out a little closer to Medium or even Medium Well, but I wasn’t going to complain. It was still good. Although truth be told, it was overcooked. I wasn’t sure what to expect with the sauce, but it really wasn’t that spicy. Yey! Then I went with a side of their brussels sprouts. They are shaved and sautéed and have something inside of them… They are just good. That’s all. Then the server suggested dessert. The little ate so well we decided sure, why not. Chocolate cake it was because it sounded good. And let me tell you, good decision. Very good descision. And there you have it… another round of where to eat in Tulsa, OK. Any restaurants I need to try?